Steedman’s division approaches Snodgrass Hill from the north. At first, it is unknown whether the approaching column is friend or foe, but they are soon identified. Colonel Stanley is wounded at the top of Hill One. Command of the brigade falls to Colonel William Stoughton of the 11th Michigan. Kershaw’s Brigade falls back from Horseshoe Ridge and takes cover along the banks of the Vittetoe Road. Humphrey’s Brigade withdraws to the Blacksmith Shop without attacking. 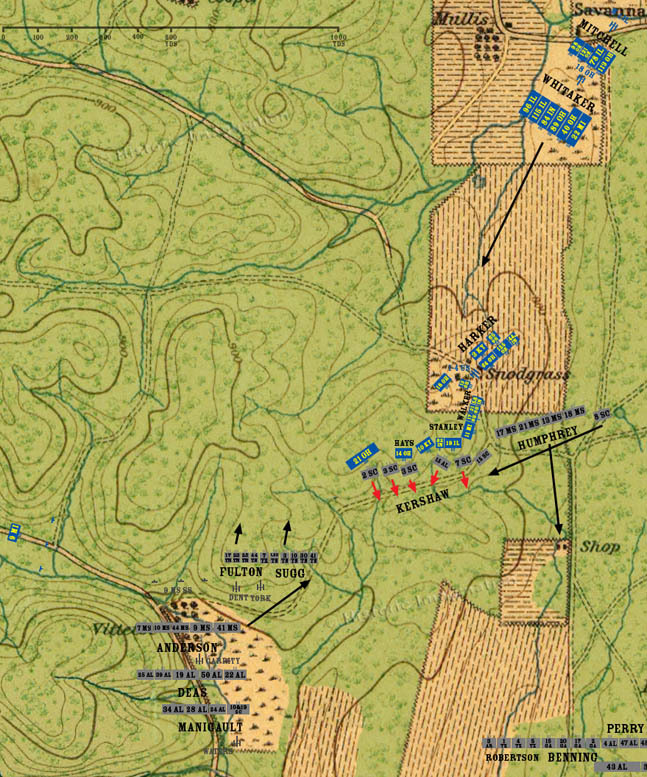 The 8th South Carolina, at the far end of Humphey’s line, moves to rejoin the rest of Kershaw’s Brigade. Johnson’s Division reaches its jumping off point and dresses his alignment. Anderson’s Brigade moves east to fill the gap between Johnson and Kershaw. The other two brigades of the division continue to resupply themselves from division and captured Union supply wagons.